McMinnville, OR - The beloved McMinnville Wine & Food Classic, which has become one of the largest and most influential wine and food festivals in Oregon's wine country, returns for its 24th year under the expansive roof of the Evergreen Space Museum in McMinnville, Oregon. More than 170 exhibitors include over 70 wineries, more than a dozen food vendors, distillers, cideries and breweries are scheduled to pour and serve their unique products to thousands of attendees from March 10-12, 2017, making the Classic one of the largest and best attended indoor wine and food events in the state. Nicknamed SIP, the event is a dedicated fundraiser for McMinnville's St. James Catholic School that has raised hundreds of thousands of dollars that go directly towards programs benefiting the school's children. Organized and staffed entirely by volunteers, the Classic is one of the largest community events of the year in McMinnville and marshals the resources of one of Oregon's friendliest and most cohesive communities. More than 5,000 people are expected to attend the 3-day festival, some who have returned every year since the festival began in 1993 as a small gathering at the McMinnville Armory. "It's a great festival," said Rich Washburn, Vice-President of Eola Hills Wine Cellars, a long-time exhibitor. "We get a lot of wine-savvy customers who come not only from across the state, but from across the country. It's a great way to spend a day or more." For wine lovers, the Classic offers truly unique choices for both tasting and purchasing of wines from throughout the state of Oregon. Willamette Valley standouts like Methven Family Vineyards & Winery, Eola Hills Wine Cellars and Willamette Valley Vineyards will be on hand to pour their exceptional Pinot Noirs, Pinot Gris, Chardonnays and other varietals, alongside smaller, hard-to-find labels like Varnum Vintners, J.L. Kiff Vineyard, Denison Cellars, and Armonea Winery. Brands from southern Oregon such as Troon, Hillcrest Vineyard and Misty Oaks Vineyard bring the state's diverse bounty of wines to McMinnville for easy tasting and comparison. 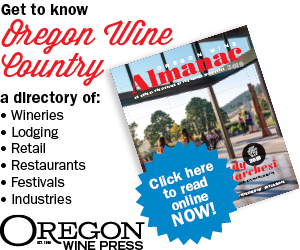 There are presently over 70 wineries signed up to exhibit, representing virtually all of the AVAs of Oregon. As with previous Classics, the wine buying experience is unparalleled as patrons' purchases are staged at a convenient booth for quick check-out and delivery to their cars. Sponsor Golden Valley Brewery will offer selections of their craft beers, and distilleries like Vinn, Big Bottom and McMenamin's Edgefield Distillery will pour samples of some of the craft spirits that are making Oregon a leader in custom, small-batch distilling. Food vendors, from barbeque and seafood to baked goods, seasonings and Mexican food will return to round out the food and wine experience. Tickets for the event are $20 general admission, $17 Seniors and designated drivers. There will be a $3 discount coupon for Friday March 10th. 3-day passes are $36. After entry, patrons pay for each tasting or food item on an individual basis. For info and to order tickets online, go to www.sipclassic.org. VIP Parking, Free Parking, and Portland and McMinnville Shuttles will be available. Check the website for details.